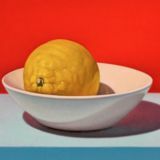 Mike Lyon [b. 1951] is a full time artist in Kansas City, MO who has been interested in Japanese art and culture since childhood. Lyon received a BA in Architecture and Fine Arts from the University of Pennsylvania in 1973 and a BFA in painting from the Kansas City Art Institute in 1975 and became a moku-hanga student of Hiroki Morinoue in 1996. Lyon has served as the Midwest Regional Director of Shotokan Karate of America since 1988. He is editor in chief of Shotokan News with over 2100 subscribers. Lyon has taught printmaking at Kansas City Art Institute and currently serves on the boards of Anderson Ranch Art Center in Snowmass Colorado, Tamarind Institute of Lithography in Albuquerque New Mexico, and Studios Inc in Kansas City Missouri. Lyon and his wife, Linda, share a stand in the second violin section of the Kansas City Civic Orchestra and have five children and four grandchildren. What is post-digital? Post-digital refers to a rising class of art that utilizes digital technology and machine tools in creative and novel ways. The term post-digital does not refer to art without or after digital processes, but rather the current opportunity to reimagine technology and mechanized processes for the making of art. 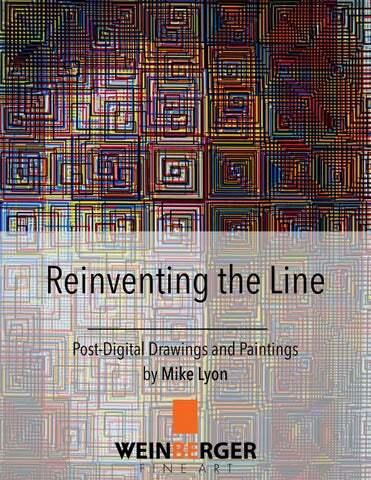 Bill North, director of the Salina Art Center, wrote of Mike Lyon’s post-digital practice saying, “Lyon’s pictures are made with ink and paper, printed from wood blocks and copper plates, or drawn with a pen. They are not output from inkjet printers, displayed on monitors, or projected on screens. It is his use of digital processes in the service of creating images wrought by analogue means that defines Lyon’s work as postdigital.” Lyon is revered as a pioneer in the field of post-digital printmaking and graphics due in large part to his use of a CNC (computer numerically controlled) router and his robust technical mastery in computer coding. Lyon reimagined the CNC, a large industrial machine traditionally used for commercial woodworking applications, and applied his coding skills to control the direction of the router’s bit along the X (length), Y (width), and Z (height) axes. Coding these precise specifications into the CNC allows Lyon to create intentional wood carving that he then combines with traditional printmaking techniques to create original work. Lyon has also discovered methods for retrofitting the CNC router assembly with ink and paint pens. Lyon then creates computer code that guides the CNC bit (pen) to create layer upon layer of intricate markmaking. Just as his original code directed the router bit to carve his woodblocks, this technique directs his layer paintings and drawings. Lyon’s process is meticulous, laborious, and stunningly innovative. Moku-hanga and “Sara Reclining” Papers for moku-hanga (Japense woodblock prints) must be relatively lightweight, exceptionally strong, and uniform in thickness without bumps, texture, etc. Lyon used paper made in Japan by Iwano Ichibei IX (b. Sept 28, 1933), designated Japanese "Living National Treasure" of paper-making, for this piece. Ichibei creates 100% mulberry paper using traditional methods. The mulberry fibers are cooked in an alkali bath made from ashes of the best grade of soba husks from Nasu, Tochigi Prefecture, and then beaten followed by running cold-water wash, and female gingko tree drying boards. Ichibei's strong commitment has been translated directly into the paper itself: simple and unadorned, gentle yet powerful washi. Left Lyon, Iwano-san, and an interpreter inside the building where Iwano-san (and his family) cook, pound, and wash kozo fiber. Iwano-san’s home/shop is in Echizen (a city in Fukui Province where a lot of paper is made). Right Iwano-san with some of Lyon’s prints on his paper and, behind him, the document which designates him Living National Treasure with the Emporer's large red seal aﬃxed.